Okay, You’ve Found Blocking, Now What? Takeaway: You’ve detected, analyzed and understood blocked processes that have happened on your machine. What can you do to avoid this blocking in the future? The Blocked Process Report Viewer github project where it’s hosted. The original blog post that explains how to use it. The last blog post that explains when to use it (with fun flowcharts). That’s an excellent question. Wallace went on to talk about a “chain reaction” of blocking where everything locked up. Man, I’ve been there and it can be disastrous. 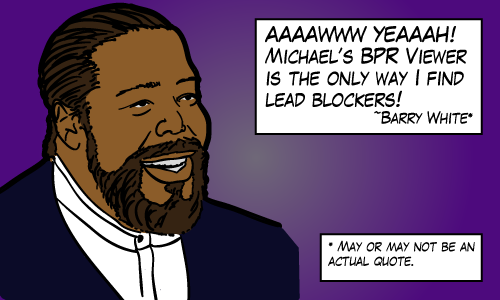 It sometimes seems like the only thing to do is to kill the lead blocker’s process. And that feels like giving up. So after giving it some thought. I came up with this (slightly reworded from my reply to Wallace). These are actions you can take to avoid blocking in the future. There’s a lot you can do to avoid excessive blocking. I’ve learned very recently that peoples’ ideas of excessive blocking vary a lot. In my environment, I look for blocking longer than 10 seconds. Other people watch for a threshold of 10 minutes! If at all possible, tune the lead blocker. If a lead blocker can get take its lock and let it go immediately then there’s no more blocking. Avoid transactions if you don’t need them (but don’t be afraid of them if you do). Pick the nicest isolation level for your transaction. Read committed is nicer than repeatable read is nicer than serializable. If you can get away with it, maybe put the query that’s the lead blocker in a transaction that uses “snapshot isolation”. It uses a bit of tempdb resources, but it’s awesome for concurrency problems. There’s table lock hints (readpast, nolock, holdlock) for more targeted locking, but really you want to understand who’s doing what before you go down that road. I’m not ashamed to say that I’ve used isolation level “read uncommitted” which is equivalent to the NOLOCK table hint. Especially when the caller can tolerate the very very rare cases of inconsistency that might result. NOLOCK is easy and you can’t argue with results – it works – but snapshot isolation is preferred because it is guaranteed to be consistent (if not current). I remember once I had a table, let’s call it T whose columns a,b,c,d, and e got queried a lot. But column x got updated a lot and we had blocking issues. The solution was to split the table T into T1 (a,b,c,d,e) and T2(x) with a foreign key from T2 to T1. We then updated queries that used it and got seriously reduced contention. And for those that are curious, my Blocked Process Report (BPR) Viewer is coming along nicely. added some documentation (which you’ve already seen if you read this blog). added a quick and dirty test suite. It’s pretty much good to go and release as version 1.0. But I still want to add features that makes it easier to analyze. Stay tuned and happy block busting! this is not about your post but about your drawings: please, please tell me that you have some for sale. I need to decorate my office with them. Thanks! I don’t have any for sale, but if you’d like, I can send you some for free as high-res (i.e. pdf) version if you want to take on the printing yourself as a one time thing. Just email me which one(s) you’d like. Oh yeah. Great series on blocking, I have enjoyed it. I admire the spurning of Comic Sans despite a legitimate use case. Claire, Promise you’ll let me know when that cartoon blog series come out?